El Capitan, powered by an EMD E1A locomoive, makes a stop in Albuquerque, New Mexico in 1938. "Drumhead" logo signs such as these often adorned the ends of observation cars on the El Capitan. A 1949 print advertisement touts the many benefits of riding El Capitan. 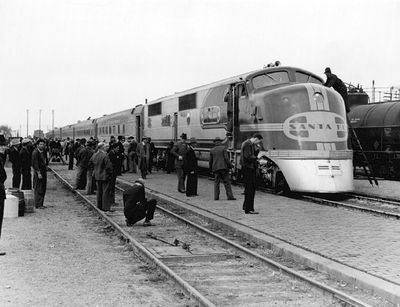 El Capitan was one of the named passenger trains of the Atchison, Topeka and Santa Fe Railway (AT&SF), second only to the Super Chief in terms of popularity and level of service provided. Its route ran from Chicago, Illinois to Los Angeles, California. This all-coach, streamlined train (assigned Nos. 21 & 22), which began operations in February, 1938 in response to the Pennsylvania Railroad's Trail Blazer, offered "low-cost passage with high-speed convenience." Originally conceived as the Economy Chief, the name El Capitan was ultimately chosen to honor the Spanish conquistadors and their influence on Southwestern culture. 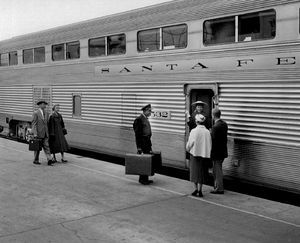 Santa Fe's extra-fare, all-coach train operated on Super Chief schedules and required the acquisition of two new trains of five cars each. The new equipment were lightweight stainless steel cars built by the Budd Company. Each of the two luxury trains were capable of accommodating 188 passengers for a mere $5.00 upcharge on the price of a ticket on the Chief. 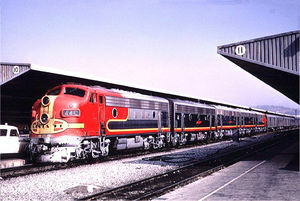 El Capitan was the first of Santa Fe's trains to utilize the "Big Dome"-Lounge cars and double-decker "Hi-Level" coaches developed by Budd in the early 1950s. These experimental cars featured a quieter ride, increased seating capacities, and boasted better views of the Southwestern terrain El Cap passed through. These cars proved so popular, that Santa Fe eventually made the El Capitan an all Hi-Level train. Today, the route formerly covered by El Capitan is served by Amtrak's Southwest Chief. Many of Amtrak's trains (especially those in California) consist of a combination of refurbished former Santa Fe Hi-Level cars along with newer Superliner railcar designs. In recent years, four "mothballed" El Capitan lounge cars were removed from storage, refurbished, and placed into service on Amtrak's Coast Starlight as "Pacific Parlour" first-class lounge cars. 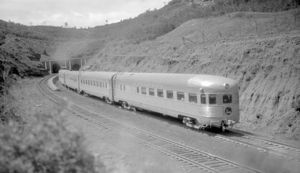 1937: El Capitan is conceived to compete with the Pennsylvania Railroad's low-cost, high-speed train the Trail Blazer. February 20, 1938: Operations commence with weekly excursions based on the same "over-the-road" time as the Super Chief. 1942: Consist size expands to 12 cars, and each logs 636 daily miles. October 12, 1947: El Capitan trains begin operating on an every-other-day basis. February 29, 1948: El Capitan begins its daily schedule between Chicago and Los Angeles. 1949: The Union Pacific Railroad reintroduces its popular all-coach Challenger train, set to run on a 39-and-a-half hour schedule in order to compete directly with El Capitan. The UP also announces that there will be no added fare for this train. October 30, 1949: Train No. 22 travels over a broken section of rail in Kincaid, California. Locomotives #19L/A/B/C derail and burst into flames, causing seven cars (including #2865 and #2878) to leave the tracks. July 6, 1950: Train No. 22 derails while traveling at 90 miles-per-hour through Monica, Illinois, and is subsequently struck by train No. 10 (the Kansas City Chief), traveling at 55 miles-per-hour. A general derailment ensues. 1952: The Budd Company unveils concepts for a double-decked coach based on similar commuter cars manufactured for the Chicago and North Western Railway and Burlington railroads. The Santa Fe plans to upgrade the cars on the Chief with the new design. 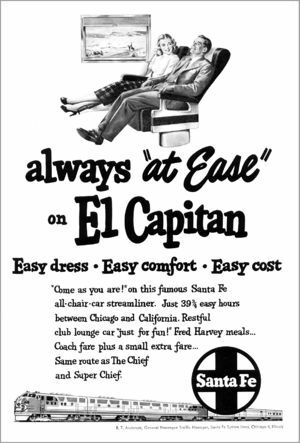 December 14, 1953: The extra-fare charges are dropped from both El Capitan and the Chief. March 1954: Six full-length dome-lounge cars (called "Big Domes" by Santa Fe's employees) are delivered for use on El Capitan by the Budd Company. July 1954: Two experimental "Hi-Level" intercity coaches arrive and are placed directly on El Capitan instead of the Chief. The railroad trial tests the units for over a year. March 25, 1955: The Santa Fe orders 47 Hi-Level cars (35 chair cars, 6 domed diners, and 6 full-length domes) from Budd, enough rolling stock to equip El Capitan on a daily basis with a few cars as spares, making it the first widespread use of such cars to over-the-road streamliners. Summer 1956: El Capitan makes three demonstration runs to San Diego, California along the "Surf Line" route to promote its new "Hi-Level" cars. July 8, 1956: Hi-Level trains commence running, simultaneously, from both ends of the line. Ticket stubs bear the verbiage "I traveled the HI-LEVEL Santa Fe way" and "Every seat is on the scenic HI-LEVEL." January 12, 1957: The Super Chief and El Capitan are combined into one train during the off-peak travel season on a 39½-hour schedule. June 18, 1957: Train No. 21 crosses over a loose tie plate while traveling at 79 miles-per-hour, causing the 8th and 9th cars to decouple; the rear section of the train then collides with the front section. February 1963: Santa Fe orders an additional 24 Hi-Level chair cars, bringing the total inventory to 71 units (enough for a 12-unit consist per train). May 1, 1971: Amtrak takes over operation of the nation's passenger service, thus ending the reign of El Capitan. Amtrak retains the use of the Super Chief / El Cap names, with the Santa Fe's concurrence. Amtrak subsequently acquires a number of Santa Fe passenger cars, including the Hi-Level coaches; the revolutionary cars serve as the inspiration for Amtrak's Superliner fleet of coaches, sleepers, diners, and lounge cars in the late 1970s. 1973: Amtrak drops the El Capitan designation. A rear view of El Capitan and its Budd-built observation car as it approaches the Raton Tunnel (Colorado side) on June 26, 1938. Passengers board El Capitan's hi-level "chair" car #532 in 1956. 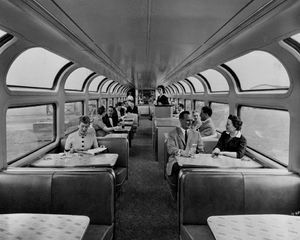 An interior view of one of El Capitan's hi-level dome-lounge cars in July, 1956. The Atchison, Topeka and Santa Fe Railway's combined Super Chief / El Capitan pulls into Track 10 at Los Angeles' Union Passenger Terminal (LAUPT) on September 24, 1966. Santa Fe purchased enough "Hi-Level" equipment to create six complete, nine-car consists. Additionally, six of the railroad's older baggage-dormitory cars had a largely-cosmetic fairing applied to the rear roofline in order to create the distinctive "transition" cars and maintain a streamlined appearance on El Capitan. The dining cars rode on special six-wheel trucks due to their massive weight (all other cars rode on conventional four-wheel trucks). The "Big Domes" were transferred to the Chief pool. Santa Fe's EMD FP45s initially led the combined El Capitan / Super Chief and other passenger train consists, though some would later transfer to high-speed freight duty when the Super C hit the rails in 1968. 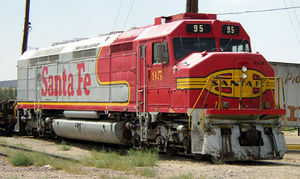 #95 (seen here in July, 2003 at the Western America Railroad Museum in Barstow, California) began life in December, 1967 as Santa Fe #105. This page was last modified 03:42, 1 October 2014.